I’ve really caught the bug now! It all started because I finally decided to face crochet head on. I have to admit, I have been a little scared of it. 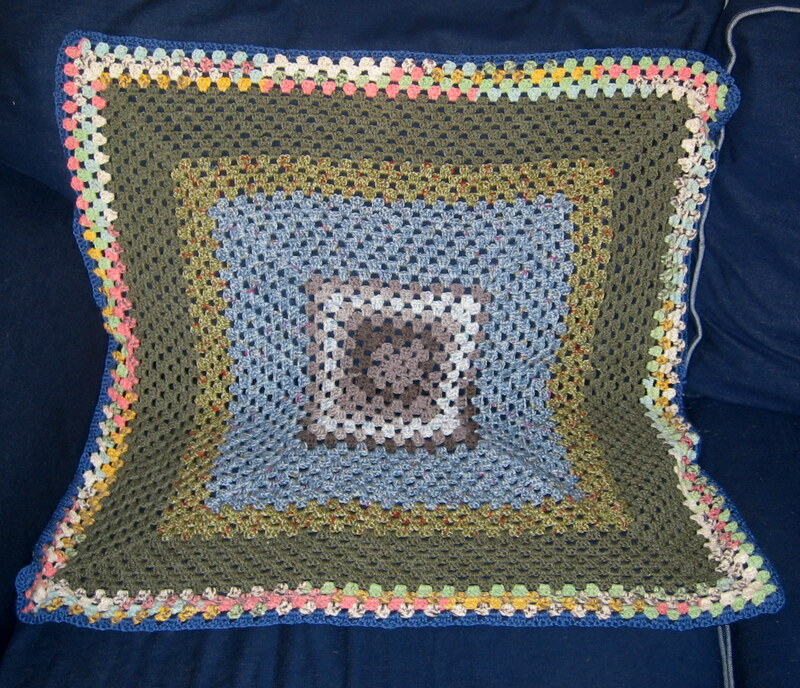 Anyway, I knitted this floor cushion out of some scraps I had left over from the hats I knitted last year. This is a chunky wool but the original pattern is for a baby blanket in 4ply. I’ve actually been using this pattern to knit a couple of baby blankets (although in DK rather than 4ply). 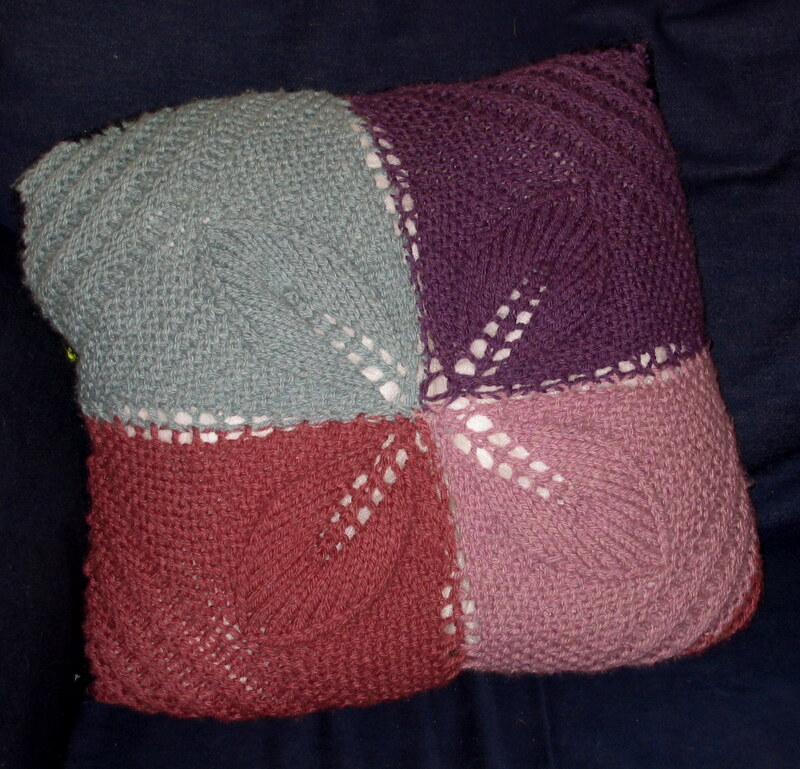 It appealed to me as it’s made up of lots of squares so adapting the pattern to what you want it for is very easy. Apart from using DK wool, I also made the blanket smaller and slimmer so it was more a buggy blanket than a swaddling blanket. Anyway, getting back to my story, I needed a back for my floor cushion. I debated about knitting a back, or using fabric. Finally I decided that this was the perfect opportunity conquer my fear. Now my way of learning something new is by repeating and repeating until it’s second nature. 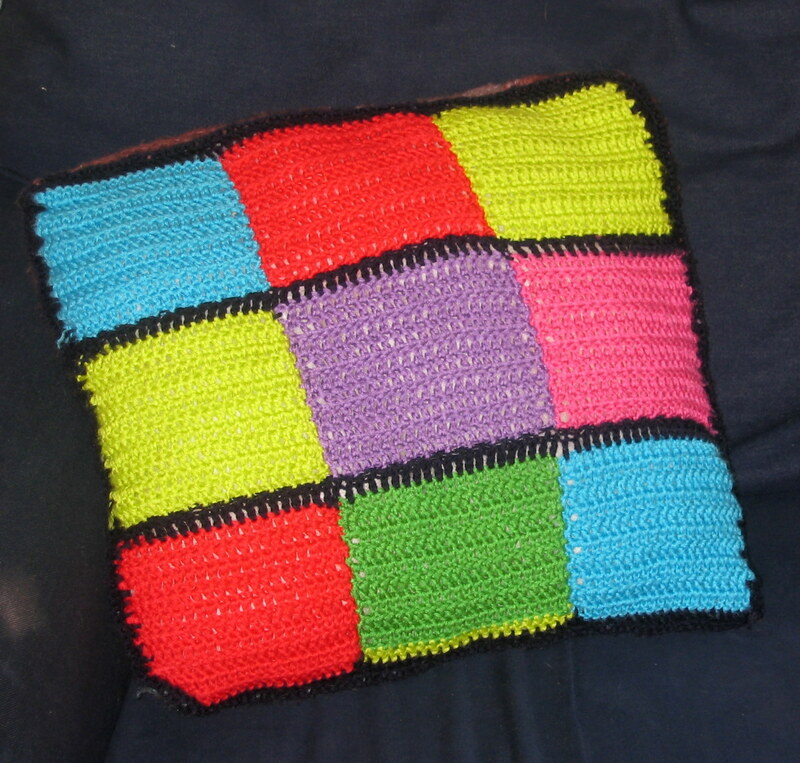 This has lead to a rather interesting cushion………..
As you can see, I used some scraps of wool that I got free with a magazine and just did line after line of trebles until I could do them in my sleep (I’m not joking, I could actually see them when I closed my eyes!). The cushion is for my son, so he doesn’t really mind the complete clash of styles and colours, in fact he quite likes it, so I suppose that’s ok. I tried to join the two halves together with a blanket stitch but it really didn’t work, so I crocheted them together with a double stitch, which worked a lot better. I like to think of it as my nod to the 80’s. I actually really like the bright bold colours.When it’s on the floor, you occasionally get a flash of colour, which looks really good. I refer to it as my cushion with two personalities. I have been doing some more crocheting. With this next project, I want you to remember that my aim was firstly to learn some more techniques and secondly to use up some left over balls of wool (I’m working through my stash, I hope you are proud of me!). It’s a lap blanket. Or a toddler car blanket. I haven’t quite decided. I was going to be selfless and give it to small one, but decided in the end that I actually quite like it and it keeps my knees warm while I sew. So I think we’ll share it. I started it with a magic loop and crocheted 3 trebles, then chained 1 (repeated 3 more times) into it; then joined with a slip stitch. I then chained 3 (to be counted as 1 trb). I then worked round, working 3 trb into each chain stitch from the previous round (working 3 trb, ch 1, 3trb into each corner and ending with a slip stitch). Every time I the ball of wool ran out I changed to another (well at the beginning of the next round). I was going to carry on, making it larger but after I worked one round in the dark blue (it doesn’t really show up that well in this picture), I decided that it actually looked quite good, so decided to finish it and start on something else.